BACK ISSUE #90 (84 FULL-COLOR pages, $8.95) spotlights EIGHTIES LADIES! FRANK MILLER and BILL SIENKIEWICZ’s Elektra Assassin, Dazzler, Captain Marvel (Monica Rambeau), Lady Quark, DAN MISHKIN’s Wonder Woman, WILLIAM MESSNER-LOEBS and ADAM KUBERT’s Jezebel Jade, and Somerset Holmes. Plus: MARTHA THOMASES looks back at Marvel’s Dakota North! 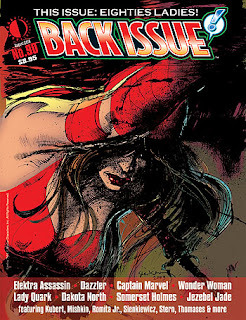 Featuring the work of BRUCE JONES, JOHN ROMITA JR., ROGER STERN, and many more, plus a previously unpublished 2003 Elektra Assassin cover by Sienkiewicz. Edited by MICHAEL EURY. Notice anything odd in that description? Like perhaps that all but one of the creators cited are men? Nearly all of the ladies noted are characters, written and drawn by men. In fact, when you check the table of contents/credits page that's available on the online preview, there are only five women credited in any capacity of the 40 or so contributors. Now, granted, a number of female characters were created by men. If you want to talk about Elektra's creation, you're going to have to talk about/with Frank Miller. But it seems to me that finding female characters from the 1980s that were created/developed by women wouldn't be that difficult, and would provide a better perspective. How about Louise Simonson and June Brigman talking about the female half of Power Pack? How about Bobbie Chase talking about She-Hulk? How about Barbara Slate talking about Angel Love? How about Trina Robbins talking about California Girls and/or Misty? How about Colleen Doran on her various A Distant Soil characters? How about Wendy Pini talking about any of a million Elfquest characters? How about Marie Severin talking about any of the bajillion characters she worked on? Cat Yronwood, Donna Barr, Barbara Kesel, Glynis Oliver... There were lots of women working throughout the '80s that could've been brought in. Jenette frickin' Kahn was the publisher of DC comics for the entire decade! Look, I like Back Issue. I've contributed to it myself. Eury does good work pretty consistently, and that's one of the reasons it's up for an Eisner this year. But it seems to me that if you're doing a spotlight issue on ladies in comics, maybe you should have more than 10% of the contributions come from women. On -isms: Evidence of Sexism? On History: Which Details Are Worth It?